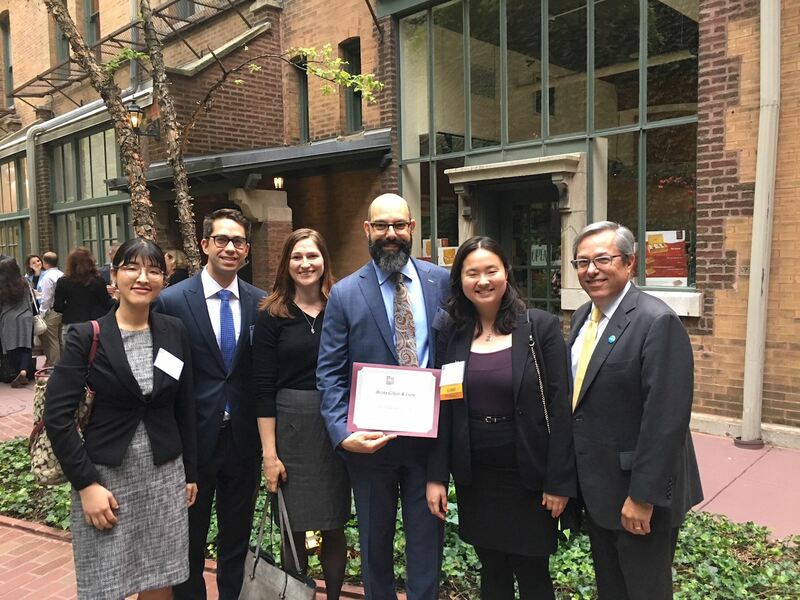 The acknowledgment recognizes law firms and corporations whose pro bono contributions in Illinois ensure that low-income individuals, families and communities have access to legal services. PILI’s pro bono programs work to increase the accessibility of legal services to those who lack financial resources to afford an Illinois attorney. The roster was announced at PILI’s Annual Pro Bono Reception on June 20, 2018. Brinks joins 44 other law firms and corporations being named to the roster this year. Among the nearly 300 guests were lawyers and legal professionals from law firms, corporations, law schools and legal aid organizations, as well as the current class of PILI Interns and Fellows. Brad Lane, current President of PILI and Brinks shareholder, introduced the Honorable Lisa Y. Wilson, Associate Judge in the Tenth Judicial Circuit and Chair of PILI’s Tenth Judicial Circuit Pro Bono Committee, who spoke about PILI’s activities in Peoria and PILI’s state-wide activities. David Lindner, Chair of the Brinks Pro Bono Committee and a Brinks shareholder, accepted the recognition on behalf of Brinks. Brinks has a firm-wide commitment to pro bono initiatives and investment in its community. These efforts are a combination of attorney’s time, skills and applicable resources to providing necessary legal services to members of the public who could not otherwise afford them. These efforts include access to social and criminal justice, residential housing matters, immigration, and court-appointed guardianships, among other areas. From left to right: Michelle Song, Louis Constantinou, Theresa Starck, David Lindner, Judy He and Brad Lane. Brinks Gilson & Lione, which celebrated its centennial year in 2017, is one of the largest intellectual property law firms in the US, and helps clients around the world to protect and enforce their intellectual property rights. Brinks Gilson & Lione’s more than 130 lawyers, patent agents and scientific advisors assist clients in all aspects of patent, trademark, unfair competition, trade secret, and copyright law. Brinks attorneys provide informed counsel with respect to innovations in a range of complex and valuable technologies, including pharmaceuticals, chemicals, bioengineering, industrial manufacturing, electronics and software, and medical devices. More information is at www.brinksgilson.com.